In celebration of the release of the newest community cookbook 30 Minute Meals for the Paleo AIP, I’m sharing one of the meal recipes that I contributed. But the best thing about my Greek Kale Salad with Turkey Meatballs is you can make 4 hearty servings in just 30 minutes. Ground turkey → Ground turkey can usually be found year round & since it’s dark meat it’s a flavorful option for meatballs. If you don’t see it in the meat department, check the frozen section. Salt → I use Redmond’s Real Salt in all my cooking because it contains minerals & trace minerals necessary for good health. Also it’s delicous. I used to buy it in small packs but now I buy it in bulk, which saves me some cash & cuts down on waste. Dried oregano → Some dried spices & herbs can contain traces of gluten. Please read labels & select options that are certified gluten-free like THIS one. Garlic → An antimicrobial superfood. Garlic has long been a part of the medicinal arsenal of people around the world & it’s uses are now being backed by science. Studies have shown that 3 cloves of garlic contains the same anti-bacterial activity as a standard dose of penicillin. Garlic is also proven to be anti-viral & anti-cancer. Lemon juice → Contains important antiseptic & antimicrobial properties. Traditionally used to treats colds, flu, coughs & parasitic infections. Raw honey → One of the most powerful & versatile antimicrobials on the planet. It is anti-bacterial, anti-viral & anti-fungal. Raw honey also possesses unique properties that stop the formation of bacterial biofilms, which can harbor all sorts of diseases. Using local honey can help with seasonal allergies unique to your area. Farmers markets and local health food stores are a great places to look for local, raw honey. To make this recipe strictly LCHF or ketogenic, use 1-2 drops of stevia instead. Extra Virgin Olive oil → Contains dozens of phenolic compounds that feature impressive anti-microbial properties. Studies have shown that some of the compounds in EVOO have greater antimicrobial activity than commercial disinfectants & can reduce bacterial & viral infections. Lacinato kale → Also called Dino kale. English cucumber → If you can’t find an organic one, please peel it. Avocado → If you love avocados, but don’t love it when they turn brown, use a ceramic blade knife to cut them & they won’t oxidize! 1️⃣ Add water and 1 tablespoon salt to pot over high heat and cover to bring to boil. 2️⃣ Combine ground turkey, 1 teaspoon salt, and dried oregano in a mixing bowl and combine with your hands. Form into 24 bite-sized meatballs. Divide each of those into 6 even pieces. Roll each piece in your palm to make the meatballs. Place the made meatballs on the other plate. Repeat this process with the remaining meat. Once you get the hand of it, you can really rock out rolling these. Chef’s Tip: Rub a little oil on your hands before starting and the meat won’t stick as much. 3️⃣ Add meatballs to boiling water and set timer for 5 minutes. 4️⃣ Peel and roughly chop garlic. Squeeze juice from lemons and add to blender along with garlic, 1⁄2 cup olive oil, 1 teaspoon salt, and honey. Blend until smooth. 5️⃣ Cut kale into 1- to 2-inch size pieces and put in a large bowl. Pour dressing from blender over kale and use your hands to massage for a couple minutes. This is the really fun part so be sure to enjoy it! 6️⃣ When timer set in step 3 goes off, drain the meatballs, getting them as dry as possible. 7️⃣ Heat 1 tablespoon oil in large skillet over medium-high heat. 8️⃣ Add meatballs to skillet and cook, moving around to brown on all sides, for 3 minutes. Remove from pan. 9️⃣ Cut cucumber and avocado into bite-sized pieces and add to kale, along with the olives. Toss to mix. 🔟 Add meatballs and toss gently. Divide equally among serving plates or bowls. ✨All done! Give thanks for this healing food & enjoy! 🔹 This meal works well as leftovers since it’s also good cold. Kale is a pretty hardy green, even though it will wilt some I think it’s still quite yummy the next day. 🔹 If you’d like to batch cook the meatballs check out my 3 Ingredient Turkey Meatballs post for instructions on how to double the recipe. It also includes Fatigue Friendly instructions! 🔹 My Anti-Microbial Lemon Garlic Dressing will keep in the fridge for 1 week so feel free to double the recipe. We routinely use a whole recipe’s worth in a single day! You can blend or whisk the dressing to re-emulsify it before serving, or simply use it as a vinaigrette. If making healing meals feels overwhelming, don’t worry, you’re not alone. 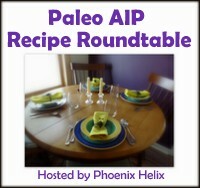 Its why a bunch of us AIP bloggers put together a collection of 120 FULL MEAL recipes: we knew our community needed a resource that made making anti-inflammatory AIP meals easy. So if you found this 30 minute meal recipe to be helpful, the 30 Minute Meals for the Paleo AIP ebook is for YOU. For all the deets, click HERE. Healing is hard work. Tasty allergen-free cooking doesn’t have to be! Let’s connect! I’m on Instagram + FaceBook + Twitter so come say “hi!” And if you make this recipe be sure to tag me cuz I wanna see & share!